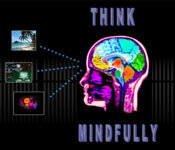 Mindfulness can help you cope with your over active mind, as its particularly helpful for people who suffer from frequent bothersome thoughts that seem to grab at your attention and intrude upon your ability to attend to the current moment. Worry and fear - "What if there is something wrong with me?" Anger - "Why can't I just have a moment's peace without thinking about something?" Depression - "I am never going to just feel relaxed." Hopelessness -"I give up. This is just too hard." Trying to not think about our thoughts and trying not to feel our feelings only amplifies their volume while paying attention to thoughts and feelings helps to separate who we are from who our thoughts and feelings tells us we are.